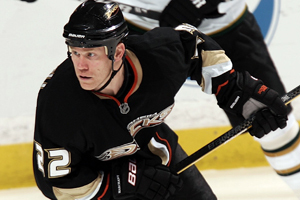 The Anaheim Ducks announced today that 18-year National Hockey League (NHL) veteran Todd Marchant has retired as a player from the NHL. Marchant will join the Anaheim Ducks front office as Director of Player Development. In his new role with the club, the Buffalo, NY native will help prepare and educate Anaheim prospects to succeed in professional hockey. Marchant, 37 (8/12/73), appeared in 421 contests over his final six NHL seasons as a member of the Anaheim Ducks from 2005-11, scoring 38-74=112 points with 230 penalty minutes (PIM). The 5-10, 180-pound center ranks third all-time in franchise short-handed goals (8), eighth in all-time postseason appearances (52) and ninth all-time in regular season games played. Capturing his first Stanley Cup with Anaheim in 2007, Marchant helped the Ducks reach the Stanley Cup Playoffs in five of his six seasons with the club. In addition to the Stanley Cup run in 2007, Marchant advanced to the Western Conference Finals (2006) and the Conference Semifinals (2009) with the Ducks. He scored the triple overtime-winning goal in the Ducks’ 2-1 victory in Game 2 of the Conference Semifinals on May 3, 2009 at Detroit. “I want to thank the Rangers, Oilers, Blue Jackets and Ducks organizations, my teammates, the fans, and most importantly, my family, for their great support over the years,” said Marchant. “I’ve had an unbelievable experience playing in the National Hockey League, and it’s simply time to move on. I’m excited to stay with the Ducks organization in my new role and look forward to my post-playing career. Staying with the Ducks will provide my family the opportunity to continue living in a great community, one in which we plan to remain actively involved." A veteran of 18 NHL seasons, Marchant appeared in 1,195 career NHL contests with the New York Rangers, Edmonton, Columbus and Anaheim, collecting 186-312=498 points with 774 PIM. He became the 31st U.S.-born player to appear in his 1,000th NHL game on Dec. 22, 2008 at Vancouver. He set career highs in goals, assists and points during the 2002-03 season as a member of the Oilers, earning 20-40=60 points with 48 PIM and a +13 rating. In 95 career postseason contests, Marchant scored 13-21=34 points with 88 PIM. He advanced to the Conference Semifinals with Edmonton in both 1997 and 1998, scoring the game-winning overtime goal in Game 7 of the Conference Quarterfinals on Apr. 19, 1997 at Dallas. Marchant played for Team USA at the 1994 Olympic Games in Lillehammer, Norway where he earned 1-1=2 points in eight tournament games. Marchant was selected by the Rangers in the seventh round (164th overall) of the 1993 NHL Entry Draft. He was traded to Edmonton for Craig MacTavish on March 21, 1994. 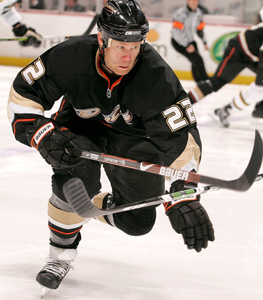 He signed as a free agent with Columbus on July 3, 2003 and was claimed on waivers by Anaheim on Nov. 21, 2005. After the season was over, I had some time to think about it. I talked it over with my family. I always knew that at some point you have to make a decision. It’s never an easy one. I felt at this point in my life and my career that it was time to move on to a new challenge. I had a great career. I cherish every day and every moment that I have been in the National Hockey League. I was never expected to spend one day in the league, much less 18 years. I’m very excited and happy. I’m ready for the new challenge. Certainly my first game against Chicago with the Rangers, scoring a Game 7 overtime-winner against Dallas when I was with Edmonton, winning the Stanley Cup in 2007 with Anaheim, playing in 1,000 NHL games - those are the kind of things that stand out for me as highlights of my career. They have been as big a part of it as anybody. They very rarely ever missed a game. It’s very enjoyable to know they are up there watching you. I certainly know how much they sacrificed over those years for me to continue to play. Now it’s time for me to spend a little time with them. When I first started in the league and I played my first game, I felt that I wasn’t satisfied with that. It was great to have it happened, but I wasn’t satisfied. The one thing I always said to myself was that no matter how I felt, how tired I was or injured I was, I was going to be a hard-worker every single day. I think that is one the big reasons why I was able to stay around for as long as I did. When I first got here, Anaheim was somewhat in the same position that Columbus was. They were in the bottom of the conference. It was a new coaching staff and management staff. We all grew together. By the end of that season, we made it to the conference final and lost to Edmonton. We certainly exceeded everybody’s expectations that year. But all it did was just raise our expectations for the next year, which was awesome. Now all the sudden, you went from hoping to win games to expecting to win games every night. That is a great thing for a team and an organization to have. What I will remember is my teammates and how much we had to sacrifice all year long. There were ups and downs. We had a great start, a mediocre middle and a great finish. Once we got in the playoffs, we were a different team. We just seemed to take the next step every round and every game as a group. I was sitting back after we won and thinking about how special it was for guys like Brad May, Sean O’Donnell, Teemu Selanne, Rob Niedermayer and me. We had been in the league for 13-14 years and never had a chance to win the Cup. I’ll never forget that. They have always treated me with the utmost respect. They have always been behind me, no matter what was happening on the ice. Our fans in Anaheim are great. They are some of the best fans in the National Hockey League. I just feel fortunate enough that I was to play in front of them for six years. After I had decided that my playing career was over, I had a meeting with Bob (Murray). He said that they were looking for someone to fill this position. I thought about it for awhile and felt as though it was a great step for me in the next part of my career. I get a chance to help develop some good, young players and help them get to where they want to be, which is playing in the National Hockey League for the Anaheim Ducks. We have a great core of players. The future is bright. We have some good, young players coming up. Hopefully, everybody can develop together as a team and get the organization back to where it wants to be – winning a Stanley Cup.